You know when you promise to bake something with the children, but then it turns out that you don’t have all the ingredients! 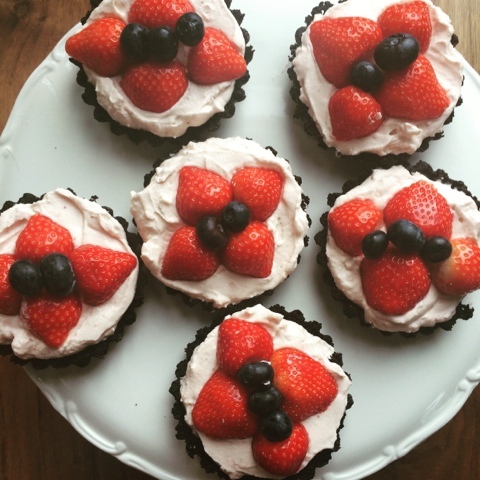 Well this happened a few weeks ago and the most wonderful little tartlets were created, that didn’t even require baking,every cloud has a silver lining. You will need six small tartlet tins with removable bases or one large one. Blitz the Oreos in a food processor until you have a fine crumb. Add the melted butter and blitz for another minute or two. Use this as the base of the tarts. Press it in very firmly and shape it using a spoon so that it comes up to the edge of the tin. Place in the freezer for 30 mins. Whip the cream using a hand held blender, add in some of the strawberries and the caster sugar while whipping. Now mix trough the mascarpone cheese. When the bases have firmed up, spread the cream and mascarpone mix evenly over them. Top with the remaining strawberries ( and any other berries). Refrigerate for a short time before serving. 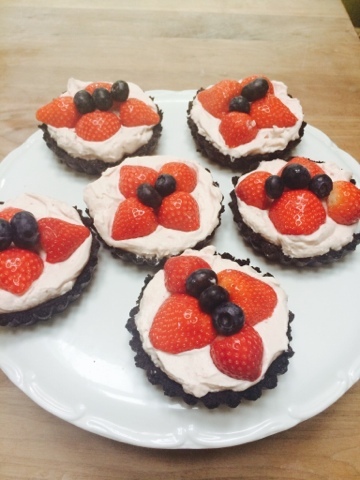 These are sweet but light…utterly delicious and a perfect ‘no bake’ summer dessert. These look so yummy however not fond on the cheese, anything you could recommend to alternate it with? You could just use cream and strawberries or you could try cream and creme fraise, the mascarpone just gives a tang to it and stops it being too rich and I thing creme fraise would do the same.